Krishna Water and Chemical Services. No Metal or Plastic Cores. Grooved cartridge with extended surface area. Available with optional End Treatments. 300°F Acrylic Cartridge Multi-length option. Broad Range of Ratings from 1 micron to 150 micron. Low Pressure Drop & Long life for consistent Filtration performance. No By-pass or unloading with high pressure drops or pressure surges. 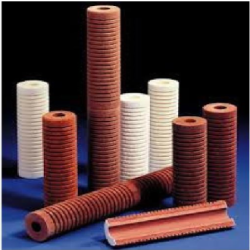 Looking for Resin Bonded Cartridge Filters ?